Strollers come in all shapes and sizes, with a variety of features to boot. Walk into any baby store and you'll see jogging strollers, city strollers, travel systems and everything in between. But which ones are the best - which is to say, which ones are the safest? • A wide base: The last thing you want while you're out and about is for your stroller to tip over, jostling your baby around (and possibly causing her to fall out if she's not securely fastened). A wide base supports even weight distribution, keeping the stroller on the ground. • Practical, accessible brakes: There will be many times when you'll need to park the stroller while your hands are full - transferring groceries to the car, juggling baby bags, etc. As such, you'll want brakes that are easy to engage. Look for strollers that emphasize easy braking on the package. When out shopping, ask a sales associate if you can see a floor-model version of the stroller and fiddle with the brakes yourself. • Storage space: If you're like many moms out there, you tend to travel heavy. Your baby's bag is full of diapers, baby wipes, snacks, milk or formula, and maybe even a toy or two. Then, you've got your coffee, purse and everything else. Think about how you travel, and choose a stroller with the appropriate features. Some have extra-large baskets attached to hold your many bags, while others are slimmer and lighter for better maneuverability. Some even have a cup holder on the handle bars, so you're never without your caffeine. • A harness and seat belt: This tip is primarily for moms who plan to buy their stroller second-hand. Recently manufactured options will have these bits included (they're required by the U.S. Consumer Product Safety Commission), but older ones may not. The features above are things you'll need regardless of your lifestyle. That said, they aren't the end of your possible stroller options. In fact, there are so many choices out there that it can be hard to determine which one you need. Luckily, if you apply the right considerations to you stroller hunt, the answer will be easy. The features you need all depend on your location, your lifestyle and your baby's age. • Location: If you live in a city, you'll need a stroller that's easy to maneuver on crowded sidewalks and packed public transit. Therefore, you're probably best off with a streamlined model or one that folds up small. You can purchase a bigger stroller if you live in the suburbs, but keep in mind you'll want one that can fold into your car. • Lifestyle: We all aspire to be the mom with a jogging stroller, but let's face it, you might not use it as often as you wish. After all, having a baby is tiring, and no one will blame if you your running regimen suffers a bit. Plus, jogging strollers are some of the most expensive on the market. When looking for a stroller, take a good, hard look at your current lifestyle and how that may or may not change after baby arrives. The fantasy version of you as a mom may not match up with reality, and that's perfectly okay. • Baby's age: Newborns don't yet have the strength to sit up or hold their heads upright, so they need a reclining stroller. • Always buckle the harness and seat belt. This way, baby won't be bounced around (or ejected from the stroller entirely) when navigating bumpy ground. • Watch out for baby's fingers - you might accidentally trap or pinch them when folding the stroller or removing the carrying basket. • Don't leave baby unattended. You never know what he can get into while your eyes are on something else. • Be careful with toys. Any that hang from the top should be securely fastened. • Never hang your bag from the stroller handle. Doing so could break the stroller or cause it to tip and fall. Instead, carry the bag yourself, place it in the appropriate basket or wear a backpack. • Keep out of the sun. The heat can make plastic or metal hot enough to burn your baby's sensitive skin. 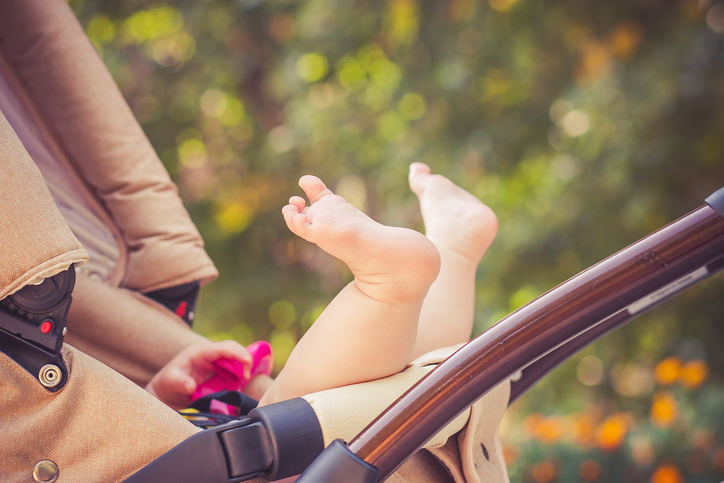 If you're leaving your stroller in the car with window exposure, cover it or use a reflective panel. • Don't cover the stroller with a blanket while baby is inside. You might think this creates shade to keep your little one cool, but it actually traps in heat. • Frequently check to see if your stroller model has been recalled, and return it immediately if so. Ready for the next step? Click here to learn more about preparing for a baby!